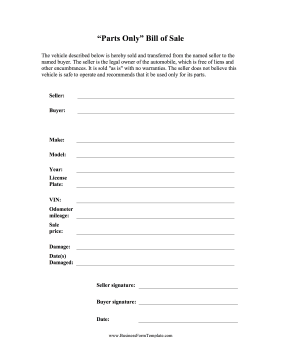 When selling a junker car that is too damaged to operate, use this bill of sale that stresses that the sale is for scrap parts only. The vehicle described below is hereby sold and transferred from the named seller to the named buyer. The seller is the legal owner of the automobile, which is free of liens and other encumbrances. It is sold "as is" with no warranties. The seller does not believe this vehicle is safe to operate and recommends that it be used only for its parts.